London Regiment (Royal Fusiliers)3rd Bn. Son of James and Annie Sharman. James, moved from Suffolk in the 1870s and married Annie Ewins. They had 9 children and lived in Salisbury Road, Banstead. James was at some point the sexton of All Saints Church and Annie, James and four of Charles' sisters are buried in the churchyard there. Photo of Charles in uniform supplied by Jim Sharman (May 2009). Note: Date of Death Discrepancy of 11 days requires investigation. 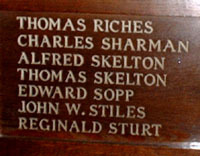 Son of Charles and Elizabeth Rosa Skelton, of 10, Pound Rd., Banstead, Surrey. Alfred Skelton initially joined the East Surrey Regiment (21990) prior to moving to the Royal Fusiliers. ALFRED SKELTON, Royal Fusiliers, has given his life for his country, and for the cause of justice and liberty. He fell in the Great Battle of Arras, which commenced on Easter Monday,the 9th of April (1917). A kind and considerate letter from the Chaplain dated 12th April brought the bad news that he was brought into hospital that morning dangerously wounded in the head, and unconscious, and that there was scarcely any hope. This letter was immediately followed by a second letter reporting that he had died the next morning. 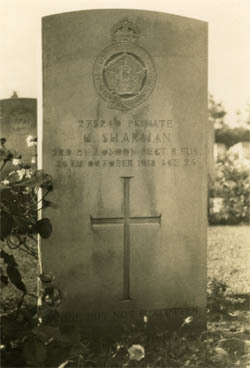 A fourth brother, Gordon Skelton lied about his age and was recruited in the Devonshire Regiment. He was sent to France, but his mother wrote to the War office telling them he was only 14 years old. He was returned from France and released into the care of his parents at 10 Pound Road Banstead. 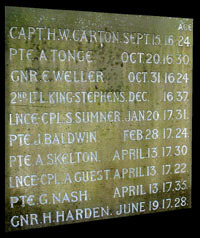 A fifth brother, Norman Percy Skelton, was two years younger than Gordon and did not take part in the war although he joined up on the 14th April 1920. Grave Reference: O. VIII. H. 12. Parish magazine page (Edna Touzel). 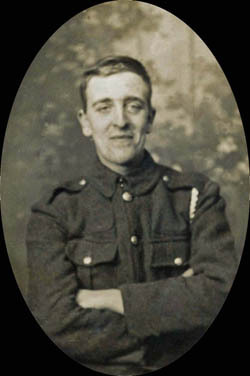 Thomas skelton was killed in action in France, Flanders. YPRES (MENIN GATE) MEMORIAL Ieper, Belgium. Son of Jason and Fanny Sopp, of 3, Dicelands Rd., Banstead, Surrey. CWGC Grave Reference: Div. 62. III. C. 7. Son of Arthur and Mary Sturt, of 65, Ivy Cottage, Burgh Heath Rd., Epsom. East Surrey Regiment 12th Bn. CWGC Grave Reference: I. B. 16. HEM FARM MILITARY CEMETERY, HEM-MONACU Somme, France.